Avalanche accidents do not happen by accident; they happen for particular reasons. "Snow Sense" addresses the critical terrain, snowpack, and weather variables that make it possible for a slope to avalanche along with the human factors that allow most accidents to happen. If you don't want to become an avalanche victim, read this book. 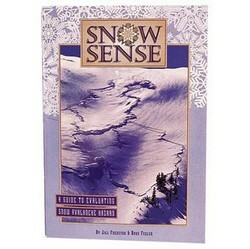 "Snow Sense" is the best-selling avalanche safety book available. Intended for skiers, snowmachiners, snowboarders, climbers and others who work and play in avalanche country. **Snow Sense is also a mandatory reading requirement for students participating in our local Columbia Gorge Snow and Avalanche Workshops.